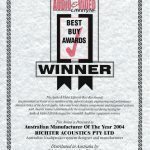 For more than 30 years our Australian designed and engineered audio products are one of the most awarded and commended in Australia. We are proud of our Acheivements to date and aim to keep out-performing our peers in the future. AUSSIEHELPERS PROMO HELPING OUR FARMERS! We were really pleased to be able to do our bit supporting our Drought affected Aussie Farmers with our Christmas Digital Radio Promotion. With the help of all our fantastic supporting customers and retailers including, Harvey Norman and Officeworks we raised and paid $5,120 to AussieHelpers. Feels good to be an Aussie Brand doing what we can. THOR 10.6 SUBWOOFER AWARDED 2019 SUBWOOFER OF THE YEAR BELOW $5000! It’s Black & White, it’s a WINNER! RICHTER, AN AUSSIE BRAND DOING WHAT IT CAN, TO HELP OUR FARMERS! 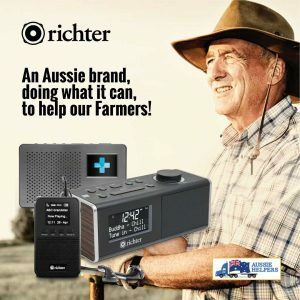 Richter Audio, a family owned Australian business, wanted to find a way to help our Aussie Farmers. We’ve decided to make a $2 donation to Aussie Helpers for every Richter Digital Radio we deliver between September 1st to December 31st 2018! 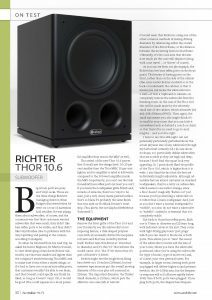 “When I say that the Thor 10.6 sounded amazing, a large part of my amazement was that I simply wasn’t expecting such a small subwoofer—and one with a relatively small bass driver—to deliver such prodigious levels of deep bass. This thing really kicks arse. And it’s not only kick-arse bass, the bass it produces is as tight as a fishes… “ Samuel White – Australian HiFi Magazine May-June issue 2018. The New Richter “POCKET” DAB+ Digital radio is a palm sized Rechargeable Digital Radio that delivers up to 9 hours continuous playback from the built in micro speaker or even longer from the supplied Stereo Earphones when fully charged. Radio is a big part of people’s lives and this Ultra Compact Digital Radio allows customers to put the world of DAB+ Digital Radio in their pocket. 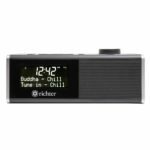 With so many DAB+ Digital-only radio services catering for different genres the Richter POCKET is the perfect addition to the Richter Digital Radio range. From the moment you turn it on you know you have an Australian brand in the palm of your hand when you’re greeted with “G’day” on the LCD screen. 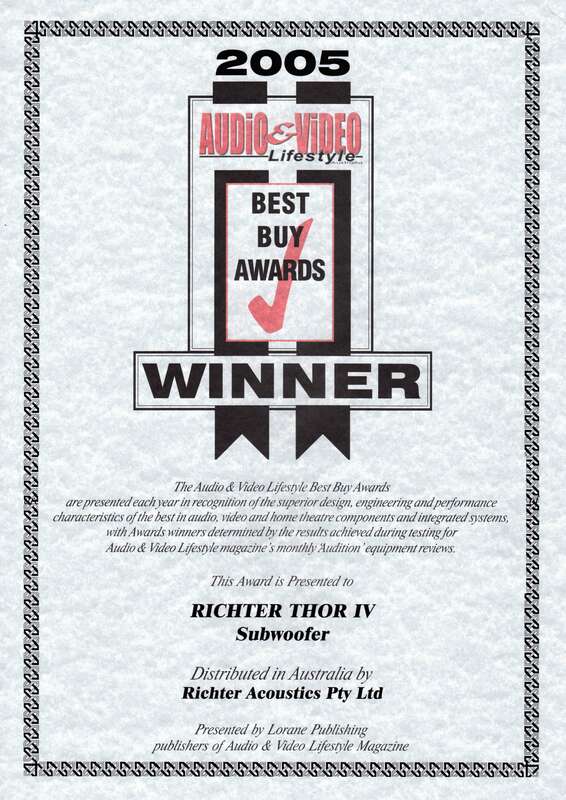 For many years Richter has delivered award winning Subwoofers, but this time the challenge for the new Thor series 6 was to deliver an all new Subwoofer that not only delivered the full Home Theatre experience but would also excel in 2 Channel Hi Fi systems. 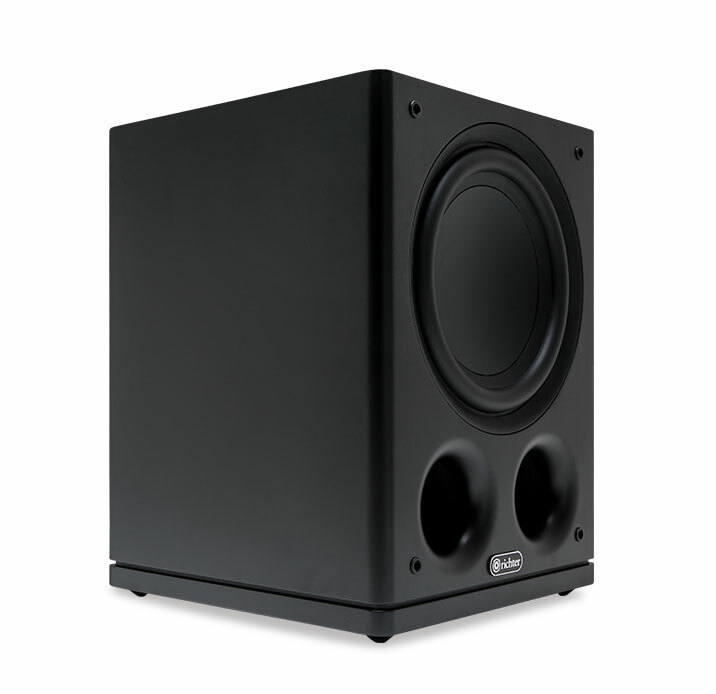 Size does matter so the designers were tasked with packaging this new Subwoofer into a smaller more versatile package, yet still being Faster and more Powerful than any previous THOR Subwoofers and so the first series 6 model the THOR 10.6 was born and now being unleashed Early December. 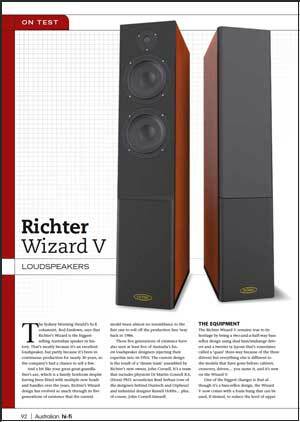 The Richter WIZARD Loudspeakers are true legend product of the Australian Audio industry and are regarded as the biggest selling Australian speaker of all time. It all started with the ground breaking WIZARD MK1 first launched around 1990 which are now in their 5th revision with the current WIZARD MKV and now the WIZARDS have been awarded an Ultimate product of the last 30 years by Sound & Image. We’ve spent a few weeks with the Wake bedside, and it pretty much gets everything right, from the compact footprint ideal for bedside use to its twin alarms, big snooze button, and a handy high-current USB charging socket on the back. The buttonry on top is clear and ergonomically impeccable (we only once needed the manual), with the ‘mode’ button switching between its four selections of DAB+, FM, its minijack auxiliary input and Bluetooth streaming…… For the full review click here. Richter Audio will launch its Digital Essentials Radio range in July, followed by a Smart Audio Digital Radio range later in the year. Digital Essential Radios deliver quality, design and performance and provide an affordable entry into the Digital Radio DAB+ market segment. 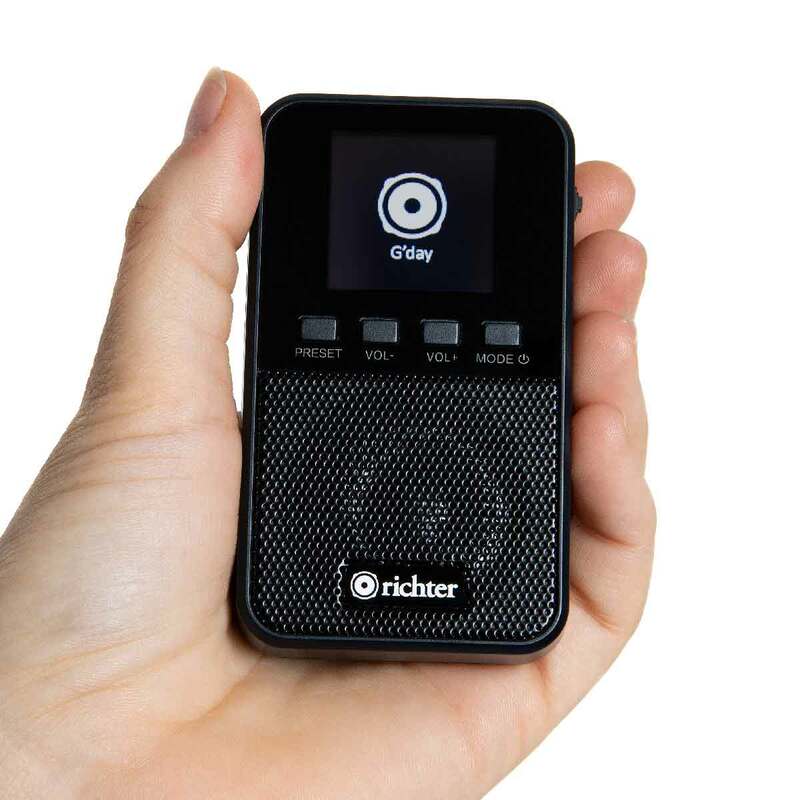 Radio is a big part of people’s lives and now that so many Digital-only radio services are catering for different genres, Richter is set to play an important role in this exciting audio category. 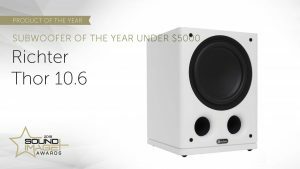 We are very proud to announce that our Merlin Series 5 Bookshelf Speakers won a joint ‘BEST LOUDSPEAKER OF THE YEAR – UNDER $1000’ at the The Sound+Image Awards. 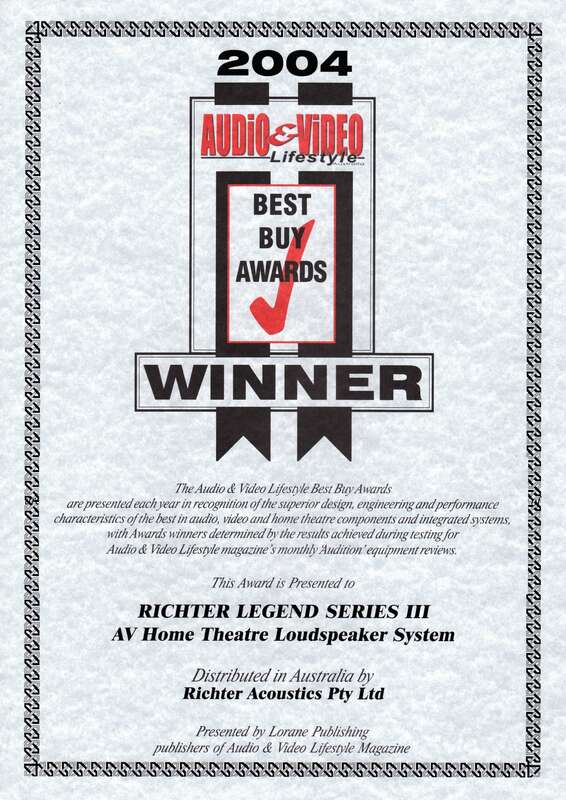 The Awards honour the best audio, incar and home entertainment prod-ucts judged from products and installations re-viewed during the previous year by Sound+Image, Australian Hi-Fi, Australian InCar, Audio Esoterica, Best Buys Audio & AV, and AVHub.com.au. They represent the very best and best value products available to the public going forward into 2017. 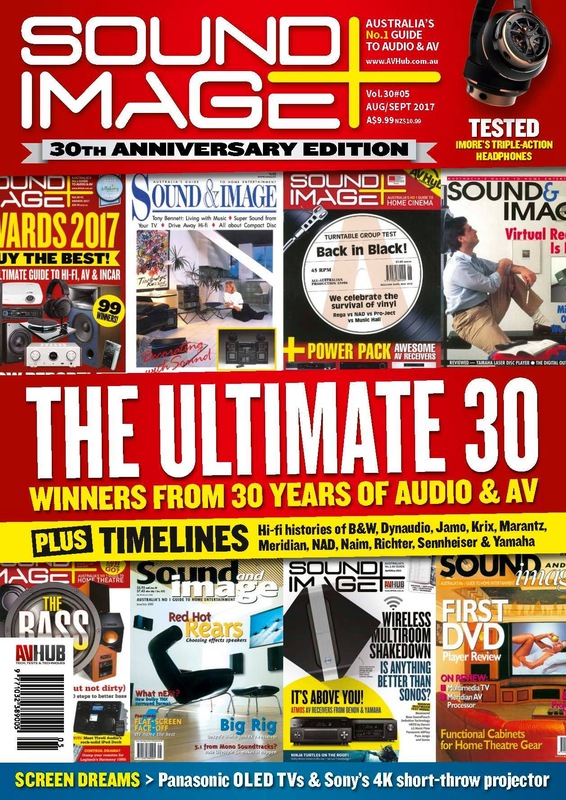 Winners will also feature in the Special Awards Issue of Sound+Image magazine. 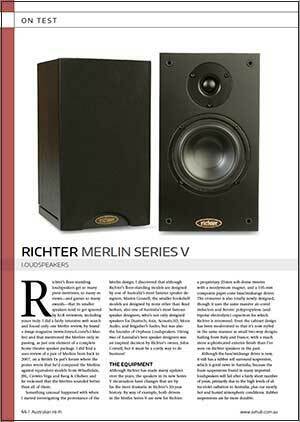 “Richter’s new Merlin V speakers sound bigger, better and more beautiful than I ever imagined a pair of small two-way speakers could sound. 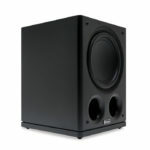 I can only repeat what I said earlier: their sound quality really blew me away. Do yourself a favour and have a listen, because I know you’ll agree.” Ed Miles -Australian HiFi Magazine 2016. “Is bigger better. Of Course it is. We all need to get away from this ‘let’s hide the subwoofer’ mentality. It would be better to embrace the concept of subwoofers… even to evangelise them.” Ernest Croft – Australian HiFi Magazine 2015. To read the full review – click here. To view the full review wizard_v_review-ahf-2015. To view the full review – click here. 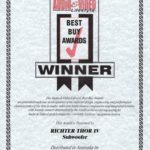 THOR MK IV – FIRST SUBWOOFER (AND ONLY THE THIRD EVER PRODUCT) IN THE HISTORY OF AUDIO VIDEO LIFESTYLE MAGAZINE TO ACHIEVE A PERFECT 100% REVIEW. 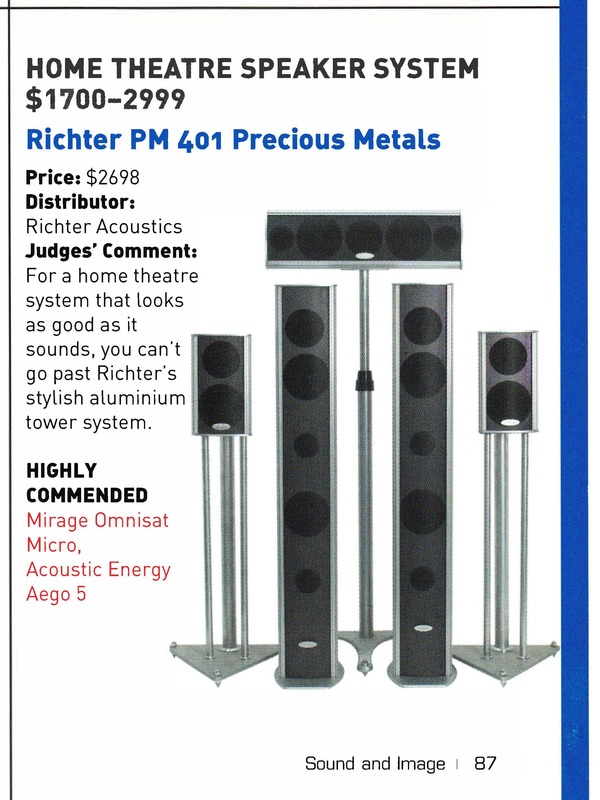 PRECIOUS METAL, PM401 – SOUND AND IMAGE AWARD – “WINNER – HOME THEATRE SPEAKER SYSTEM OF THE YEAR.” Judges’ Comment: For a home theatre system that looks as good as it sounds, you can’t go past Richter’s stylish aluminium tower system. 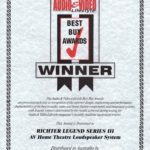 AUDIO & VIDEO LIFESTYLE MAGAZINE “HOME THEATRE SYSTEM OF THE YEAR”. 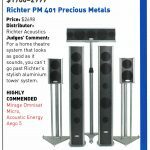 SOUND & IMAGE MAGAZINE – “HOME THEATRE SYSTEM OF THE YEAR”. 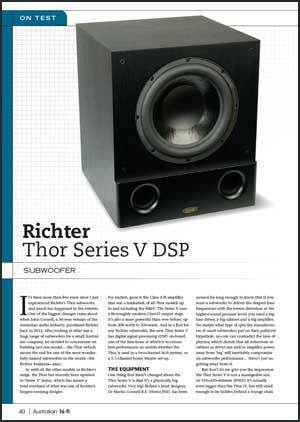 “SON OF THOR” – SOUND & IMAGE MAGAZINE – “SUBWOOFER OF THE YEAR”. 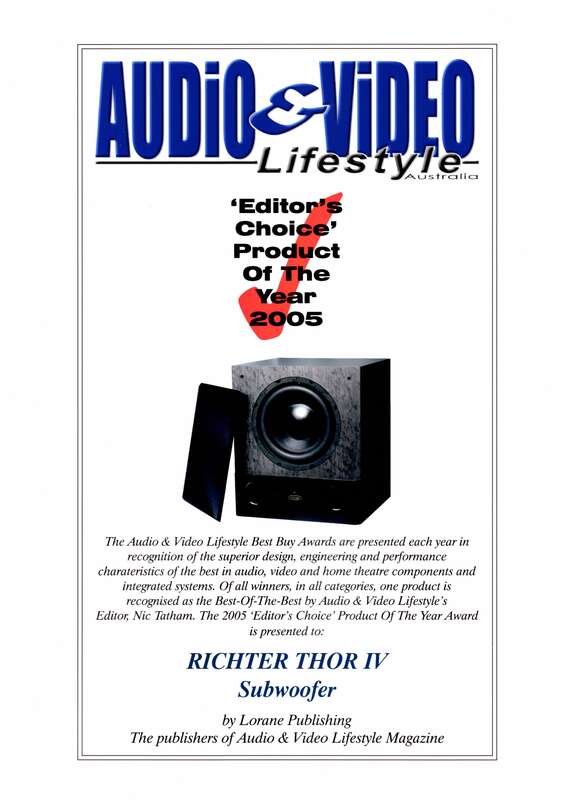 “THOR’ SOUND & IMAGE MAGAZINE – “SUBWOOFER OF THE YEAR”. 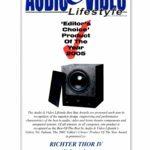 THOR” – AUDIO & VIDEO LIFESTYLE MAGAZINE – “SUBWOOFER OF THE YEAR”. 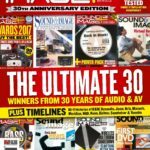 “EVOKATOR” SOUND & IMAGE MAGAZINE “SUBWOOFER OF THE YEAR” (SECOND YEAR RUNNING). 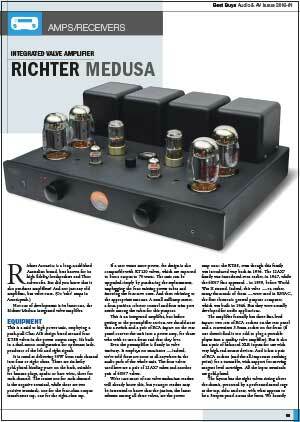 “EXCALIBUR” – AUDIO & VIDEO LIFESTYLE MAGAZINE – “BEST BUY – LOUDSPEAKER OF THE YEAR”. 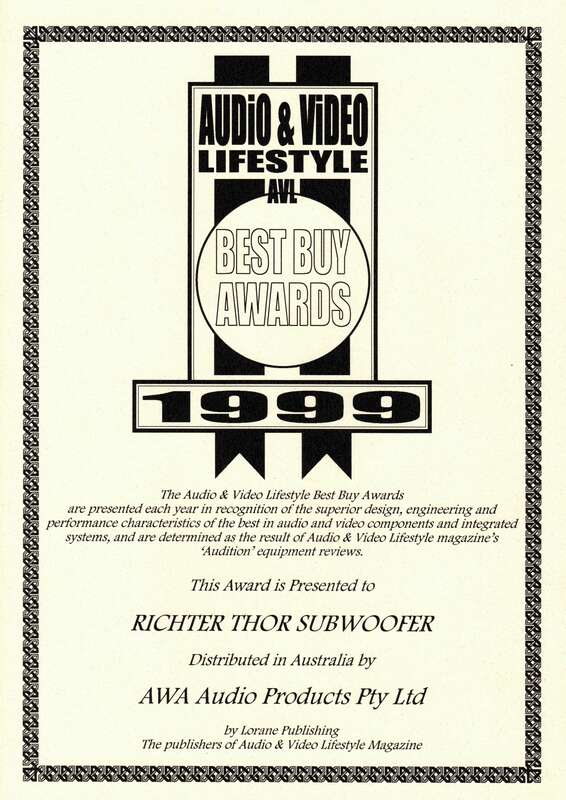 “EVOKATOR” SOUND AND IMAGE MAGAZINE – “SUBWOOFER OF THE YEAR”. 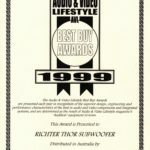 “HARLEQUIN” – Consumer Electronics Suppliers Association – “LOUDSPEAKER OF THE YEAR”. NSW SMALL BUSINESS AWARD. –“SMALL BUSINESS OF THE YEAR”. “PALADIN” – Consumer Electronic Suppliers Association – “LOUDSPEAKER OF THE YEAR”. “ORACLE” – AUDIO & VIDEO LIFESTYLE MAGAZINE – “BEST BUY”. 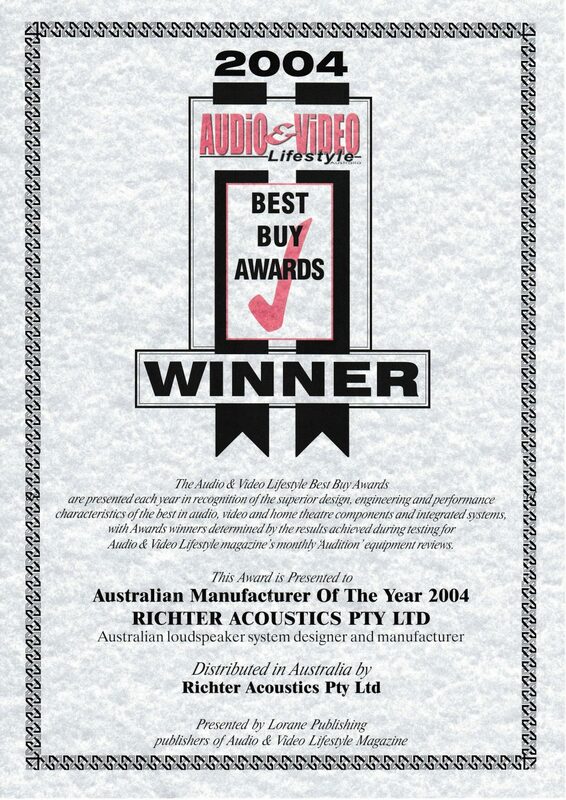 In 1986 Richter Acoustics was founded in Sydney Australia, by passionate Speaker Designer Ralph Waters.